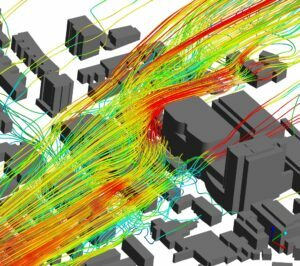 CFD is becoming an increasingly popular alternative or complement to wind tunnel testing when assessing the environment adjacent to buildings and its impact on pedestrian comfort. We have developed efficient methodologies for evaluating the suitability of building developments against standard criteria and offer both technology transfer and project services. Planning applications for large buildings in the urban environment often require wind microclimate assessment. Traditionally, this has been undertaken with wind tunnel testing of a scale model but simulation has now become established as a practical option. By early involvement in a project while building massing is still flexible, we can help to engineer out problem wind flows and avoid expensive last minute delays in the planning process. We work closely with architects, developers, councils, civil & structural engineers and planning consultants to understand wind flows around new developments. 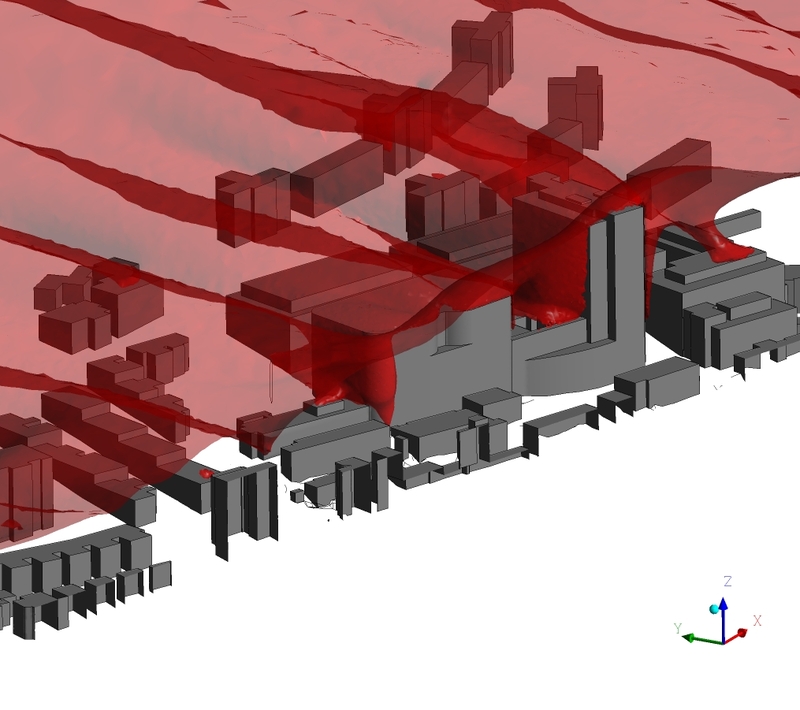 This includes terrain analysis and study of meteorological data, using CFD for early identification of potential issues with pedestrian safety & comfort and the evaluation of any necessary wind mitigation measures. Through a pragmatic yet effective approach, we are able to deliver results efficiently and accurately compared to alternative assessment methods. In addition to consulting services, we help companies involved in wind engineering develop their own capability through the supply of ANSYS CFD software and training. By modelling wind flows, we can also investigate the effect of pressure loading on structures, through 1-way or 2-way fluid-structure interaction (FSI) capabilities. We are experienced in helping clients use structural analysis in conjunction with wind flow simulations to design in accordance to relevant codes such as BS EN 1991-1-4 and BS EN 1993-4-1. The wind assessment undertaken by Wilde benefited the business, as it was a cost effective solution to the evaluation that was required for the planning application. It provided a graphical response to a very technical analysis, which I believe planning officers will appreciate as it is a concise and easy to read/understand... In addition, due to the size of the development, CFD offered a solution that captured all the areas of the development at once. The work provided enabled us to present high-quality information to the client, which is excellent, given that the building is going to be an iconic one.